It was the last day of 2017, and we started the day in a hotel room in St George, Utah. It was fitting that we find ourselves in St George on this day. I had always dreamed of retiring to St George someday. Now I am ‘retired’, but I don’t have any plans to move. 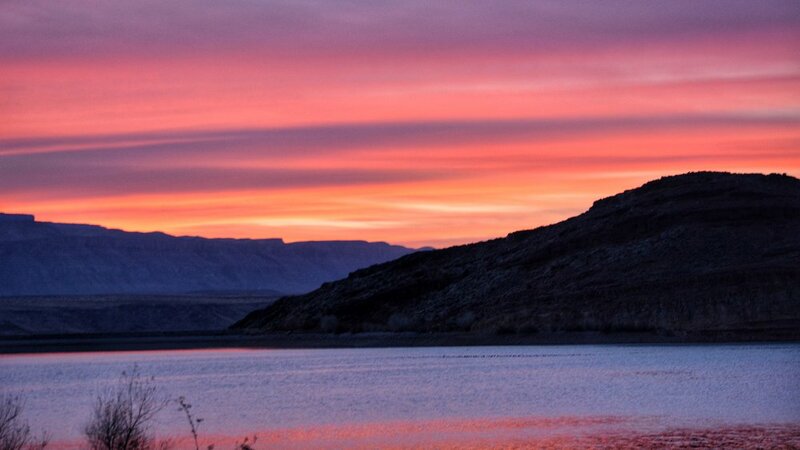 We left the hotel shortly before sunrise and found our way to Quail Creek Reservoir. I had scoped out the reservoir and state park on the map the previous day, and we wanted to capture the sunrise over the mountains and water. This location had the makings of a great photo. We drove north for a time, then took the Hurricane exit. Finding this in the dark was no easy feat. I should have used the GPS, but we just drove until we found a dark body of water, and a place to park. We were early, so we waited for over an hour. Sunrise was shortly before 8A. The photo above was one of many we took, but the sun remained hidden by the early morning cloud cover. This cool photo was taken by Teresa. A new day, a new year ... a new start. Happy New York Year. Make 2018 the best year, ever.